While the Mozartkugel, has enjoyed a meteoric rise since the nineteenth century, the Mozarttorte – a cake – has experienced a somewhat neglected existence. This might be due to the fact that the Mozart cake has no uniform appearance. We took a closer look at Salzburg’s best examples of the Mozarttorte. There isn’t even agreement on the ingredients. Nougat is the only common denominator mentioned by bakers and confectioners in relation to Mozarttorte. There’s even disagreement when it comes to pistachios and almost half the manufacturers don’t use marzipan or leave marzipan as a decoration on the outside. “Lots of customers don’t like marzipan”, explains Markus Götzenauer of Café Classic. This is the first surprise we encounter. The Mozarttorte tastes light and doesn’t look like you might imagine it to. Of course, this cake is often requested here on the ground floor of Mozart’s house. It’s not just popular with tourists, but with locals too. 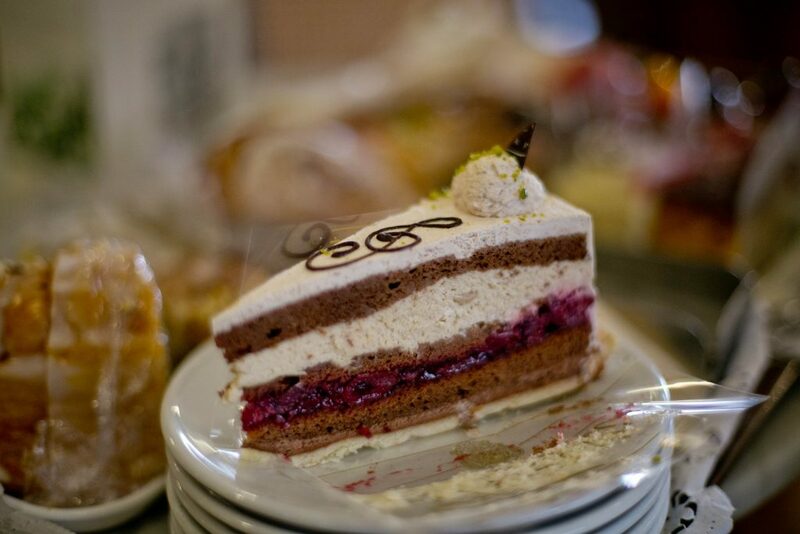 The Mozarttorte at Café Classic are supplied by the confectioners Konditorei Moser in Seekirchen. The guild master herself makes it, but it isn’t a fixture in the window of her own café. At the Tortenmacher they don’t even try to live up to the cliché. 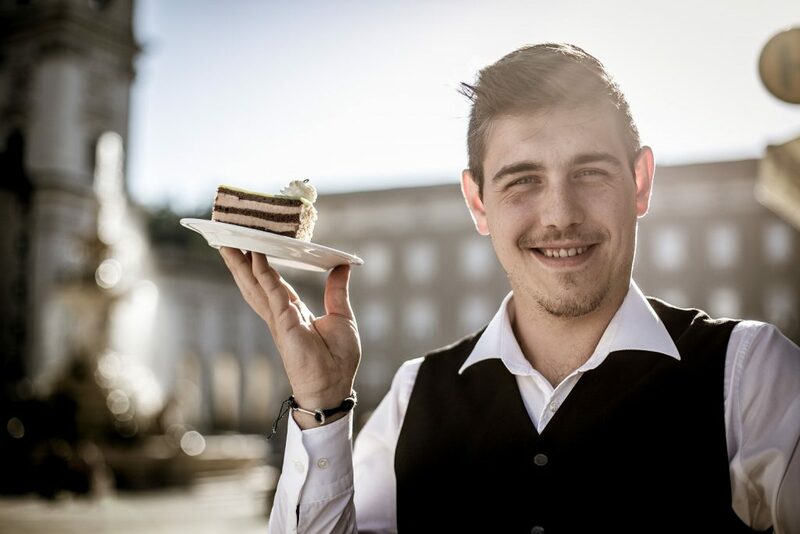 “That’s why we call our cake a Figarotorte – if you order a Mozarttorte, this is what you get”, explains master confectioner Herbert Wagenleitner. 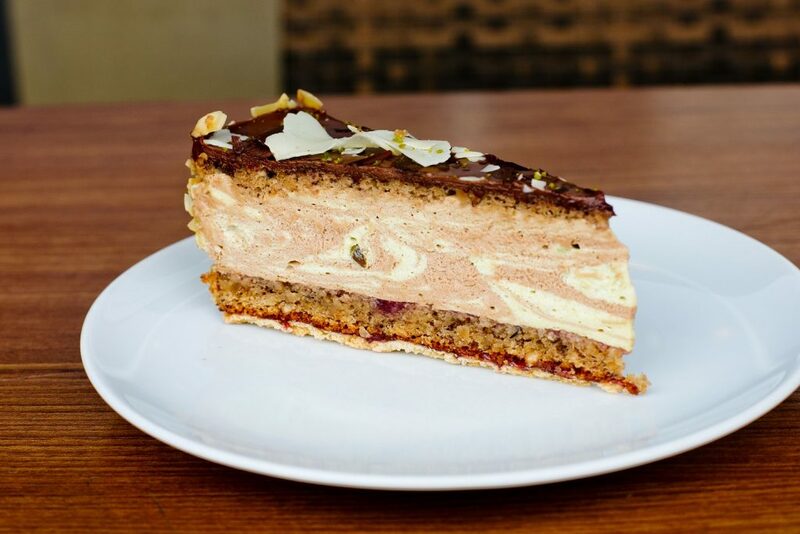 If a café already bears the name Mozart in its own name, you naturally expects a Mozarttorte. In Café Mozart on the Getreidegasse the cake looks quite traditional: dark chocolate base, pistachio cream, light base, nougat cream, dark chocolate base, marzipan layer, cream rosette and the decorative Mozartkugel, or at least a quarter of one. In MozArts on the Residenzplatz only half a decorative Mozartkugel is present. If you want to guarantee getting a Mozarttorte, you should call and make a reservation. “It’s good, but there’s no more left” is the answer in most confectioneries that we visited in the late afternoon. At Tomaselli the pistachios have been replaced by hazelnuts and even cherries have been added for a fruity flavour. Shortcrust elements and biscuit can be found in the layers. At Café Glockenspiel, right on Mozartplatz, the cake is coated in a green layer of marzipan. 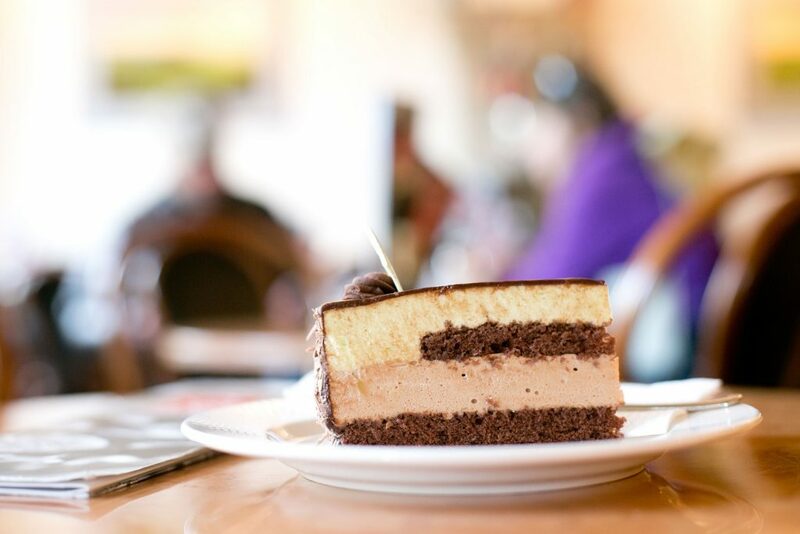 It looks the way you expect a Mozarttorte to look: nougat cream, chocolate cream and lots of marzipan. And as an extra there is a free look at the Mozart statue. You couldn’t get any more clichéd. 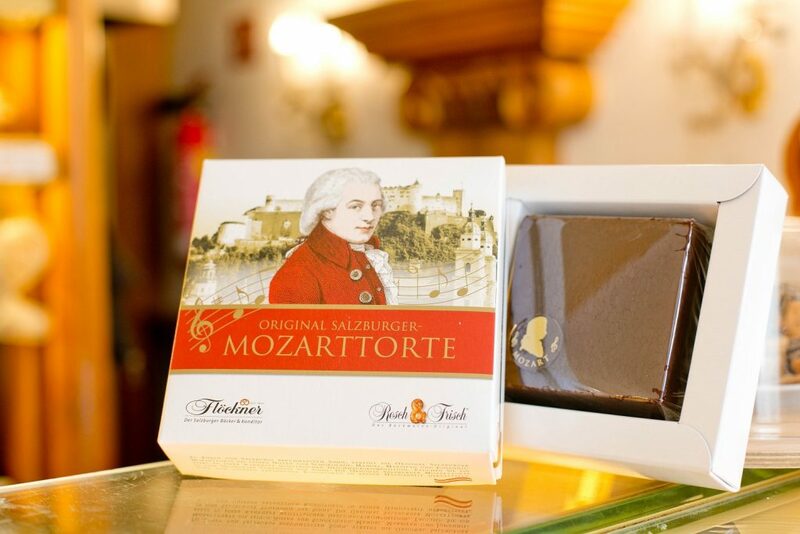 You can find the Mozarttorte to take away in a practical box at Flöckner. The cake is suitable for shipping and as a souvenir. It looks like a square Sachertorte from the outside and contains chocolate, cocoa, pistachios, marzipan and almonds as well as redcurrant jam. St. Gilgen also lives up to its reputation as a Mozart town. 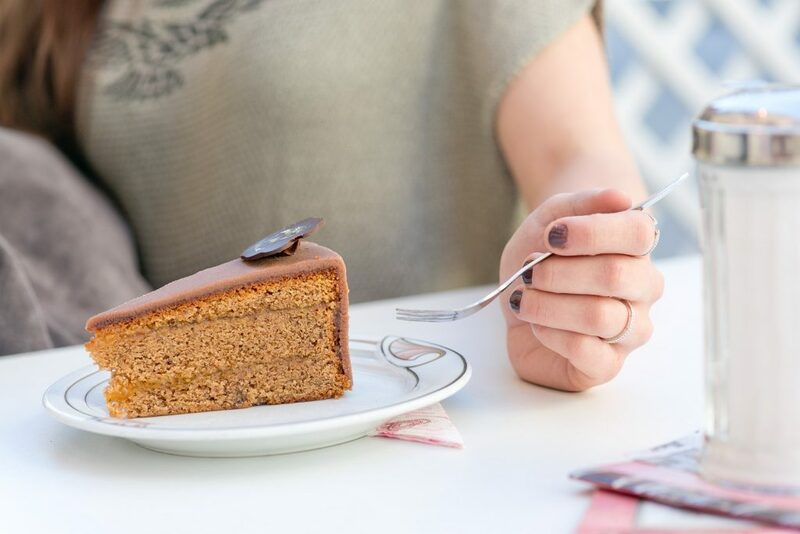 Café Dallmann serves Mozarts Reisetorte, which is made from chocolate, almonds, marzipan, nuts and orange jam and does not forget to point out that the cake is also very durable when travelling. Mozart travelled for more than ten years, although the cake did not exist at that time, of course. The only thing that has been passed down is that Mozart had a sweet tooth.